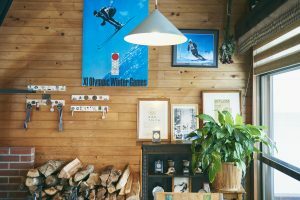 A ski rental shop named “Rental Otsue” is located near the trail to Daisen-ji Temple. 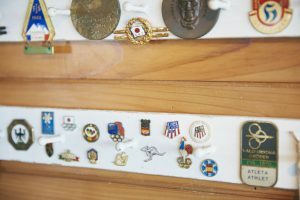 This shop is run by Masahiko Otsue, a 1972 Sapporo Olympic athlete. I took the stairs on the side of the building and found a café with a picture of Mt. Daisen painted on the wall. When I opened the door, I felt the warmth and coziness of a mountain hut all around. 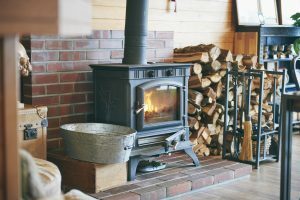 There was a big wood-burning stove, and the crackling sound of fire wood and the fluttering burning flames warmed my body and soul. Yukari Otsue, the owner of the café, left Tokyo where she had lived for a long time, and moved to Daisen, her husband Masahiko’s hometown. They renovated a closed down coffee shop Masahiko’s parents used to run, and opened Mont Café, a pancake specialty shop which is very popular among young local people. Yukari used to teach English for many years in Tokyo, but her father-in-law’s death lead her to Daisen and run a café here. First, Masahiko moved to Daisen, and Yukari stayed in Tokyo for a while to learn about café management at an institute. “Drinks are the main items at a café, so you must be able to make delicious coffee” her teacher said. 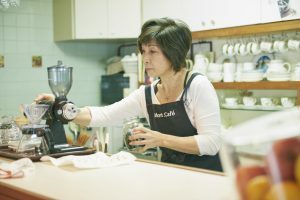 Abiding by her teacher’s lesson, Yukari created her original blended coffee. “It was a continuous process of trial and error because I did not know a lot about coffee” Yukari laughed. 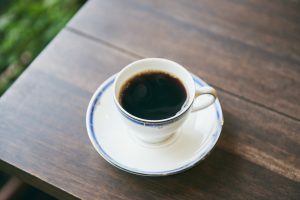 Her original blended coffee made of delicious spring water called “Seijo-sen” was refined and refreshing in taste. There are some secrets about the café’s signature dish, pancakes. 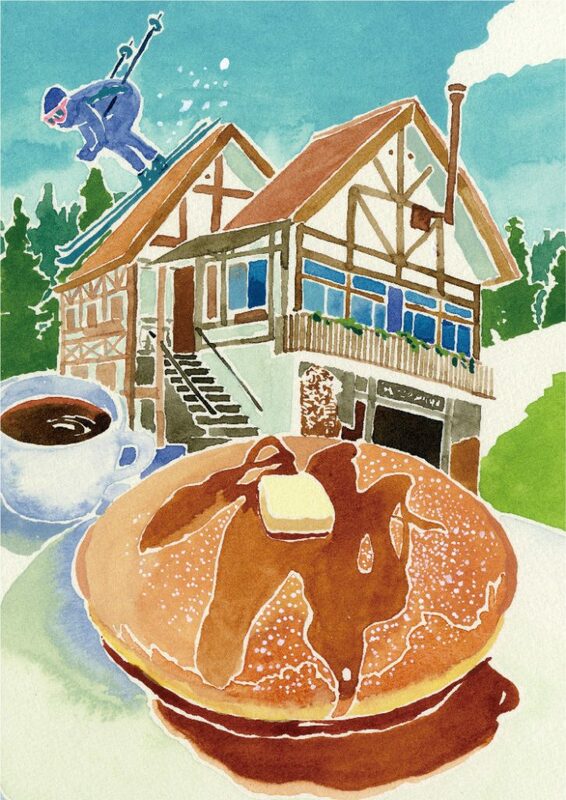 The recipe of Mont Café’s pancakes is the same as that of Tokyo’s famous café, Ginza West. Yukari is a friend of Ginza West’s owner as she had the opportunity to work there for a while and acquired its recipe. It is quite a surprise to see a famous Ginza dish served here in Daisen. What’s even more amazing is that Yukari turned it into her own Daisen dish by carefully selecting local ingredients such as eggs from Ogawa farm, Daisen’s Shirobara (white rose) milk, and Seijo-sen water. Yukari broke some eggs into a bowl. I could clearly see how fresh the eggs were by their prominent yolks even from over the counter. She explained some secrets about the pancakes in her clear voice and soon poured the dough into a frying pan. “It will be ready in about 15 minutes.” She said. In 15 minutes, the café’s most popular dish, “Ricotta Cheese Pancake” was served. The pancake immediately absorbed the syrup and the bright color of raspberry sauce made the pancake look more appetizing. The sourness of the sauce and the sweetness of the syrup further brought out the great flavor of cheese and pancake. The next dish was “Mixed Fruit Pancake.” Strawberries, blueberries, bananas and fresh cream were colorfully decorated on a pancake and that made my mouth water. I don’t have a sweet tooth, but since the pancake itself is not so sweet, I devoured the whole pancake with ease. “Compared to big cities, there are things we don’t have here and our life is sometimes a bit inconvenient, but we are fortunate to live close to nature” said Yukari with a beautiful smile. This urban recipe is now filled with local flavors as it has all the goodness of Daisen’s nature. The Beer Hop Gambarius Where You Can Taste Beer That Skillfully Combines the Philosophy of the Creator and the Blessings of Daisen!